In the age of information, typing has almost completely replaced handwriting, so it is more and more important to learn typing fast … then, the sooner the better! This program provides teachers and professional educators a training course to teach the youngest to type with the 10 fingers without watching at the keys. The program offers a training in ten graduated and methodical steps together with fun animation games that stimulate a prolonged exercise, forcing children to focus the eyes on the screen rather than on the keyboard. 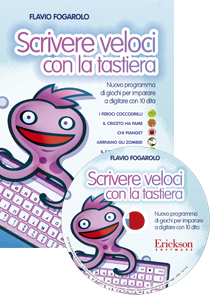 Children and adults can quickly learn to type like expert typists, effortlessly and thanks to its flexibility, the software is very helpful for teaching students with dyslexia, dysgraphia or dysorthographia, how to use the computer.